We at PLS Print are proud to announce a new joint venture with fine artist Ken Bucklew to print, promote, and sell an exclusive line of nature greeting cards to the public. The story actually goes back many years and involves a long time friendship between PLS Print President, John Blair, and fine artist Ken Bucklew. They grew up together in the small town of Spencer, Indiana where they would ride dirt bikes and explore the great outdoors. Ken Bucklew’s story is one of determination and perseverance As a young man, Ken was involved in an accident that left him paralyzed from the neck down. The doctor told him he would never walk again. As if that wasn’t bad enough, his budding career as an artist looked like it was about to be cut short since he was not expected to regain feeling in his hands. But over the course of a few years and hours of rehabilitation, Ken miraculously regained most of his mobility and is able to walk completely unassisted, and perhaps just as important was his ability to continue creating amazing works of art with his hands. Creating and selling artwork became Ken’s full time passion. John and Ken remained friends through all of these events. Taking note of the fact that Ken Bucklew is a fine artist and John runs a commercial printing company, there was always a hope that one day a partnership could be struck that would leverage both sets of skills. Earlier this year that idea came to fruition when PLS Print and Ken Bucklew agreed to launch an exclusive line of greeting cards that have never been sold to the public. There will be 8 series to start with and each series consists of 4 designs. All artwork is based on originals that were created by Ken. PLS Print created an e-commerce website which can be found at www.shopkenbucklew.com – where you can browse and purchase these greeting cards. Each nature greeting card pack comes with 8 cards and 8 envelopes. All cards are blank inside so you can use them for any occasion. 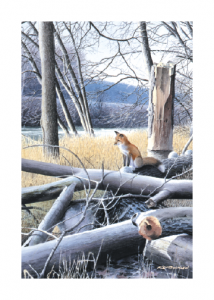 These cards are great for wildlife and nature lovers. The first two series we’ve launched are “At Home In The Wild” and “Wild Birds” and they showcase many of the beautiful places Ken has traveled to during his life. This story is 40 years in the making and we are excited about the possibilities that lie before us.